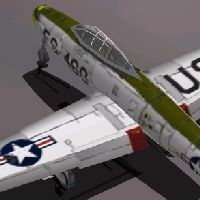 Comments: Thunderjets over Korea (2002) allows you to fly the F-84e Thunderjet in the Korean War using the Microsoft Combat Flight Sim simulation engine. 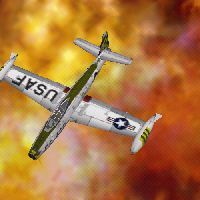 "This is a new set of a dozen Missions (USAF_F84e_001 to 012), to be played singly or as a campaign, featuring the F-84e Thunderjet USAF Fighter created by Tim "Piglet" Conrad, and taking place over an authentic Korean landscape created by Bill Potvin,II. - cfsops.com. Contact the authors Mike Eustace and Doug Attrell- let them know how much you enjoyed their missions.